Make your fence as visually appealing as possible! Are you tired of your boring fence? There is nothing unique about the typical white picket fence. Many homeowners hate that their fence does not add any aesthetic appeal to their property. 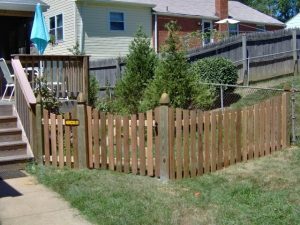 Believe it or not, there are several things you can do to improve the appearance of your fence. Use your imagination and turn your fence into one of the highlights of the neighborhood. A great way to make your fence more appealing is by attracting wildlife to it. This can be done in a number of ways. You may want to consider adding some bird houses along your fence. Imagine how cool it would be to have cardinals, bluebirds, and hummingbirds constantly flying through your yard. If you don’t like bird houses, you can certainly use other things like bird feeders and bird baths. Plants are a simple addition that can transform your fence. There are all sorts of vibrant plant life that you can choose from. Plants will give your fence a more natural and earthy look. You may also want to consider creating a vegetable garden along your fence. Not only will this make your fence more appealing, but you will have fresh vegetables at your fingertips. How about adding some lighting to your fence? By doing so, you can spend more time in your yard at night. During the summer months, you can start having your family meals outside. With lighting along your fence, your fence will look stunning at night. It is your fence. You have complete control to do whatever your heart desires. If you have a great imagination use to transform it into something special. The possibilities are endless! This entry was posted on Friday, June 9th, 2017 at 11:13 am. Both comments and pings are currently closed.